At a trade show, in a sea of competitors, backlit wins the eye, the attention and the impression of the passing trade show visitor. We have a backlit display that we absolutely love! Featherlite’s Radiant portable backlit system will simply dominate, outshine and out-impress any traditional exhibits unlucky enough to be on either side of you. Radiant’s Soft-Source Lighting™ is the soft punch that knocks you out. Radiant’s internal LED backlighting makes your panels glow. When a panel is the light source, the eye automatically goes to it. Backlighting makes your impression panels more striking. Backlighting encourages instant engagement at an emotional level. They give you an edge. Show-stoppers become startle points . Backlit elements help you integrate text with more engagement. Externally lit or unlit panels do not engage in the same way. Radiant’s Dynamic Canvas System™ give you options. Multiple planes are key to leading the eye across each element. Component separation lets you balance impression and information. 3D elements help soften text-heavy content. Choreograph more interesting and engaging journeys for your audience. Radiant’s Framing elements turn your exhibit into a gallery. Everything looks like a set piece within your setting. Your days of looking like art on a fridge are over. 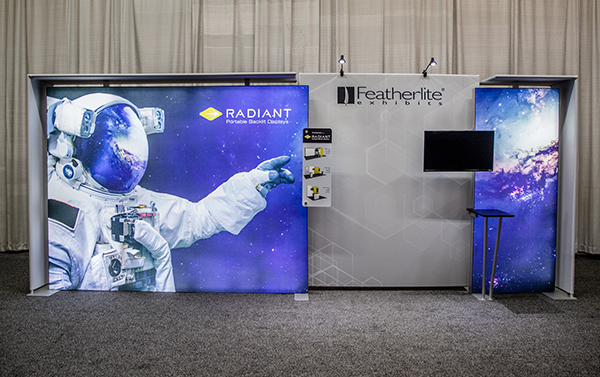 Radiant is a complete solution: it has just about every feature you might need or want to be the best in your industry at the show. Click on the video below and see more of why Radiant Portable Backlit Displays made it onto our Best Of Trade Show list for 2018. 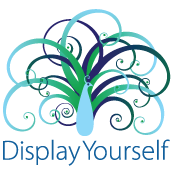 Call us at 204-943-7551 or email info@dimensiondisplay.ca to come by our showroom and learn more about the future of trade show exhibits!